Flat lining (also called a straight run, or bombing) is basically going straight down a slope. There is obviously not so much technique to flat lining, as it is basically staying in one position. What is important though, is the position. Although there is no set position that needs to be used, unless you want to go as fast as possible, whatever position you use must fulfill certain criteria to have control. You must bend your knees. The chances are that you are going to be going quite fast, and you need to be able to handle any bumps that might come your way. So making sure you have plenty of movement available in your legs is very important. You should have your weight evenly on both skis. This enables you to quickly put a turn in, in either direction should you need to, and also lets you recover if you start to loose control of either ski. Your weight must be over the middle of the skis lengthways (longitudinal weight distribution), so that you have full control over the skis. If really going for it, on a steep enough slope, you will reach a point where you are going too fast to try and slow down, as trying to turn would just result in a crash. This is where you just have to hold on and hope you make it to the flatter area at the bottom, where you can start to lose your speed. Also when flat lining the skis are often kept a bit further apart than hip width. 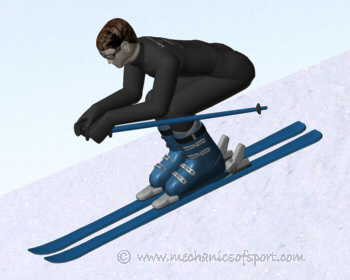 This is because when in a crouched position to be as aerodynamic as possible, you limit the movements you can make with your body, and keeping the skis a bit further apart reduces the need to make so many corrections and movements. As well as giving the skis a bit more room in which they can move in. When going fast it is not too uncommon for a ski to start to snake and try to fly off in a different direction. You must have enough control to recover on the other ski, and put the ski that you started to lose control of back where it's supposed to be. The reason this happens it that one of the edges starts to catch in the snow, and tries to send the ski off in the direction it wants to go. 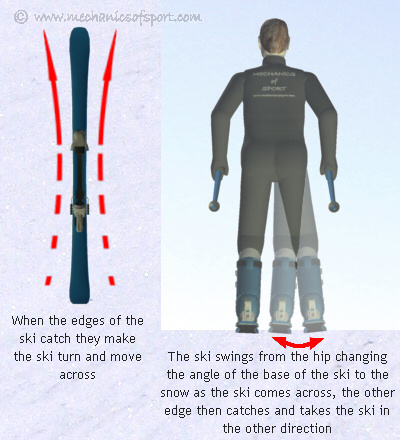 Whichever direction it is though, when the ski starts going across it will make the angle of the ski to the snow change (as the skiing swings like a pendulum from your hip), so that the other edge catches and tries to send the ski in the other direction, this then changes the angle of the ski to the snow again so that the original edges catches again, and this repeats itself until you either bring it under control, or the ski flies of in one direction, often resulting in you crashing. The best way to bring the ski under control, is generally to lift the ski up off the snow and put it down in the position it's supposed to be in. Another thing to be careful about when flat lining slopes is, that while you are going straight down a steep slope, you have to effectively lean back so that your weight is over the middle of the skis. When you get to the flatter area at the bottom though the skis will come to a flatter angle, and you will need to lean forwards from the position you were in, to keep you weight over the middle of the skis, and maintain control. If you do not do this, you can end up leaning a far too far back, losing control and crashing at a very high speed. Be careful where you choose to flat line, you need to watch out for any other skiers or snowboarders around, make sure there is plenty of room to get out of any trouble, and stay within your limits. Only try and flat line smooth slopes, as if you hit moguls at high speed you will be very lucky to stay standing, even small bumps can be formidable obstacles if traveling very fast. On to the Carving section.